Tables are Excel’s way of allowing you to manage and analyse a group of related data in a structured way. You can turn a range of cells into an Excel table at the click of a couple of buttons & this then provides a wide range of analysis possibilities. They also make you focus on keeping your input data away from your calculations, leading to much neater spreadsheets. What are the benefits of using tables? Are there any downsides of using tables? The main one is that, at first glance, formulas look a little “odd”… rather than seeing, for example =F2*G2 your formula will be something more like =[@[Qty Sold]]*[@[Sold Price]] where the “@” symbol relates to “this row” & the items in the inner “square brackets” Qty Sold and Sold Price relating to the name of the field (i.e. the column name); these are known as Structured References. The reason why there is an “inner” set of  is because there’s a space between each of the words & it’s Excel’s way of showing that this relates to the same thing. If you want to avoid that, then removing the space between each of the headings would mean that the formula above would be =[@QtySold]*[@SoldPrice] which is slightly neater. Every column of your table needs a name that must be unique (but that’s just common sense!). 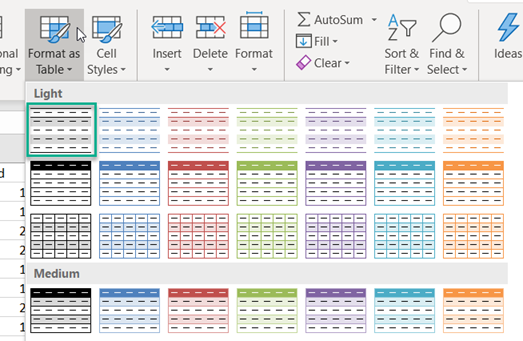 If you insert a new row, to preserve this, Excel will initially call it Column1 which you can then change. This entry was written by colinfoster, posted on November 19, 2018 at 10:10 pm, filed under Microsoft Excel, Tips and Tricks and tagged Autofilter, Excel, Filters, Freeze Panes, Functions, Pivot Table, Spreadsheet, Structured References, Table, VLOOKUP Function. Bookmark the permalink. Follow any comments here with the RSS feed for this post. Comments are closed, but you can leave a trackback: Trackback URL.